Artificial Shrimp under popping cork during Winter? I catch a disproportionate amount of fish right after my lure has hit the water. Not that I don't catch them during the rest of my retrieve, but figure the lure is only in that just-hit-the-water place for a couple of seconds out of every cast/retrieve. Fish are eating machines and trout/redfish will absolutely poach a meal off of one of their buddies. A lot of times that "plop" of the bait landing is an alarm bell that something is being chased in the area, and they will move toward it to check it out. I almost hate to say this, but I've been in spots (recently) where if I didn't get a hit on the first few cranks of the handle, I would rip the lure back in and make another cast. I know that may sound strange, but that was my high-percentage move. It was obvious that the bait hitting the water was attracting fish, and the first bounce off the bottom was getting lots of action. The rest of the retrieve was a grind. The popping cork does the same thing. I'm not much for popping and letting the bait sit still, but I will give it a pop and let the lure settle for a second before swimming it with a slow retrieve. If you watch a shrimp, they spend a lot of their time slow-peddling and then hop when threatened. What JWM says about keeping a shrimp in motion makes sense. The occasional pop draws attention, but the shrimp-like movement is what gets strikes. Like I said, fish are eating machines. If they get a shot at easy calories, they will almost always take a bite. But always remember that they have to take in more calories than they expend in hunting. If they didn't they would slowly starve. Generally speaking, they will favor the area where the most food is available, with the least effort. So if they are plucking at critters crawling on the bottom, or swimming near the bottom, that's your high-percentage retrieve. They may leave that to snipe an easy meal, but they aren't nearly as likely to leave their forage near the bottom to chase something up high. That's why in the winter I would favor a pop and slow-swim retrieve. But that's also why I would study JWM (Marker54) and copy what he does until I get good at it. We tend to get stuck in habits, and it's always good to be adding something new to your bag of tricks. PS - I released him since he’d been swimming hooked to that cork for what appeared to be a couple of days. I figured he wanted something to eat after dragging that cork around. He was still feisty and pulled drag when I snagged the cork with my lure, so he was fine. Whenever available I get live shrimp, even in winter. But I am gaining more and more confidence in the shrimp imitation lures out there. In the spring and early fall in port M the piggies and lady fish mess you you on every cast. I have been using the Voo-Doo Shrimp under the cork and in my situation is is about 2 or 3 to 1 live vs. artificial. HOWEVER, I asked for and got (Santa!) some of the Marker54 lures and can't wait to try the one with the eye in the middle of the body. So far in my pool test it looks like a real deal shrimp under a popping cork and plan to try some different popping rhythms to see if what works best. will add a little pro cure shrimp to smell it up. Going to port m first week in Feb and will report back. LOL. Oh man, that's terrible. I would have totally missed it if you hadn't posted the follow up. Is that a Sebile Stick Shad you snagged it with? When I first looked at the picture I thought what the heck kind of rig is that. Then I read your post and it made sense. Good job in your “catch “ and release. I love seeing a moving cork. I’ll go to great lengths to retrieve one. I’ve “caught” reds, trout and flounder on rogue corks. I still use a clear plastic bubble cork in the winter with all sorts of different artificial lures. Old Hump and Bingo lures work well as do soft plastics and even spoons. Works very well in the winter as well as in the summer but I prefer to use the clear popping cork in the winter. Just slide your line through the cork, break a toothpick in half and secure the line top and bottom at the depth you want. There are other reasons a lure can be more productive. 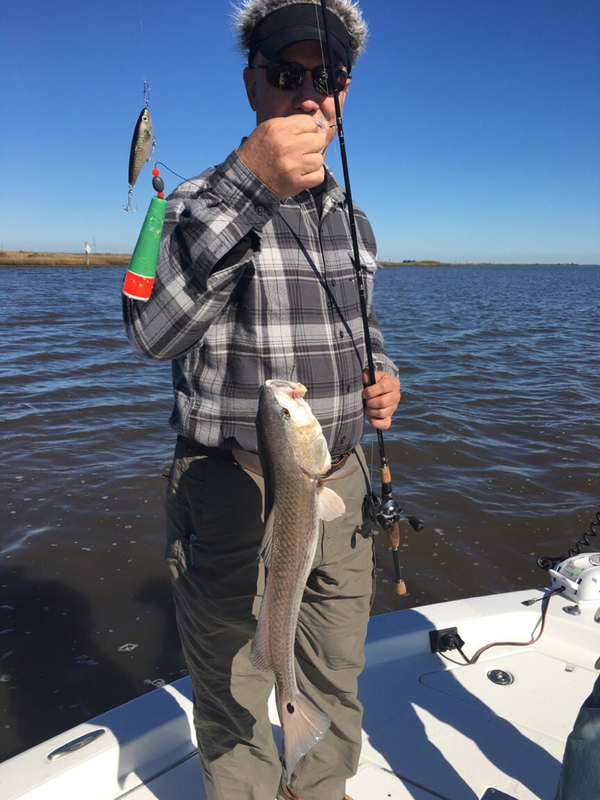 When the fishing is fast and furious it's much quicker to get back in action with a lure instead of having to go get another shrimp and put it on your hook. When fishing is like that I will always use an artificial over a live shrimp, and they are deadly under corks even for folks with little fishing skill. In that situation a lure will be much more productive. Second thing is a lure is sometimes easier to see. A shrimp is made to blend in. A lure is made to stand out. In some light and water quality conditions I just do better on lures than I do on shrimp and I think it's because the fish can find the lure easier. I always say the best time to fish a gulp under a cork is when we are drifting and the waves are whitecapping. When it is just to the point that it's almost too rough to be out drifting, that is when I do best on gulps under a cork. The wave action helps and the water is quickly getting dirty. I have actually thought that the draw of baitfish to a gulp may be one of the things that makes it work well. Just about every fish likes gulps. They are dang near like fishing dead shrimp. I don't know why but you will have hardheads eat them, pinfish pick them apart, croakers love them, sheepshead love them, etc. So when you are fishing and there are tons of piggies, small croaks, small hardheads, etc I have to think those fish cause a commotion as they try to kill that gulp and are picking at it. Most of those fish grunt or croak. I think that commotion draws in other predators like trout. Last thing, sometimes working a cork constantly works well but more often for me it's the pop, pop, pause routine that produces the most. A cork will draw a fish from a long way away and I think you have to let them have time to track it down and find it. The only time I prefer steady popping with a cork/lure is when the water is dead calm and then I would rather be throwing a straight lure. I think when it is super calm sometimes a cork is too much. Not all the time but sometimes. The majority of the time when you hear trout popping you'll hear a pop or two or three and then a pause. Even when they are real thick under the lights at night and feeding aggressively they tend to follow that pattern. I try to mimic what I have heard real trout do with my cork. As for the original question of why the buddys do better. They probably have more confidence, are fishing harder, are using a different cadence, etc. Whatever it is copy it. It happens all the time. Almost daily I will see one person will have the hot rod for the day. And I also see some folks catch on, copy what they are doing and start catching and others stand around doing the same thing they have been doing and go on and on about how that guy has all the luck. If your buddies are catching and you are not start looking at the little things. How are they working their lure or bait? How deep are they fishing? How fast? Popping it alot or pausing alot? Are you rigged up the same way? Are you casting as far as they are? I have guys who will tell me they are fishing exactly the same way as the guy who is catching and I am sitting there watching them and they are not. It can be a very minor thing that makes a big difference. Hover Shad Softee....... actually works very well in the shallows and catches fish consistently, even those not already hooked up. We were in water 2’ deep or less picking off reds hanging out with mullet. I like the Sebile, but at $9 a lure, when a big un runs off with it and it doesn’t come back, the $5 Softee is easier to justify. I lost 2 Sebiles one wkd, one on a big bull that swallowed it. He thrashed as we went to net it and cut my line on his gill plate. Tied on a new leader and my other Sebile in a hurry to get a line back in the water.....1st case, backlash, line comes to a screeching halt, leader breaks off at my new knot....2nd Sebile goes sailing 100 yds downwind, where I’m sure it got eaten by a big fish as it flashed around in the water.